If you are expecting a new baby or have recently welcomed your new arrival, you’re probably doing everything in your power to support and promote a consistent nap and sleep schedule. But more important than making sure your baby sleeps through the night or naps at a consistent time each day is making sure your baby is safe when he or she goes to sleep. While no parent or caregiver wants to think that their baby could be at risk of SIDS or suffocation, it’s important to know the risk factors so you can do everything in your power to prevent it. To help you make the best choices possible, our infant CPR class instructors in Raleigh are sharing the latest information for safe baby sleep practices. Not only can you use this information, you can easily share it with grandparents, babysitters, and other caregivers to ensure your baby is as safe as possible, no matter who he or she is with. While we see commercials and ads of a parent napping in a recliner with their newborn baby, those images reinforce dangerous practices. Your baby could fall, slip, or accidentally turn into the furniture upholstery, raising the risk of injury, entrapment, or suffocation. Instead, when your baby falls asleep, if you’re feeling drowsy, too, transfer your baby to a separate sleep area that is specifically designed for infants. For babies under a year, a crib or bassinet is optimal. However, if you want your baby close, consider a co-sleeper that attaches to your bed while providing a separate sleeping surface for your baby. If you are unable to directly supervise your baby’s sleep, curved beds, swings, and infant carriers are not recommended as safe napping locations. 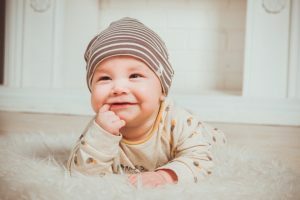 When you do place your baby in a crib or bassinet, it’s normal to worry about him or her being cold, wanting something to snuggle, or even thinking your baby may prefer sleeping on his or her tummy. Unfortunately, all of those things significantly raise the risk of SIDS and suffocation. Instead, always put your baby on his or her back to sleep and the only thing that should be in a crib or mattress (besides the baby!) is a fitted sheet. This includes bumpers that both the American Academy of Pediatrics and the American SIDS Institute warn against. If you worry about your little one being cold, consider a “wearable” blanket like a sleep sack that goes over pajamas or even choose a fleece sleeper for cool nights. Exposure to second-hand smoke. Never smoke around a baby, and if you have smoked, wash your hands and change clothes before holding him or her. If you are pregnant, don’t smoke during your pregnancy. A pacifier can be beneficial to help your baby to sleep and reduce the risk of SIDS, but make sure the pacifier isn’t attached to clothing, a blanket, string, or a stuffed toy. Avoid overheating by checking for sweating or seeing if the baby’s back or chest feels too warm. While it’s a terrible thing to think about, even when you do everything to reduce the risk of SIDS and other sleep-related injuries, it’s important to be prepared. Either before your baby is born or as soon as possible, take a first aid and CPR class for infants in Raleigh that’s approved by the American Heart Association. You’ll learn not only how to administer CPR, you’ll also know how to give the Heimlich maneuver and provide other forms of first aid. At CPR Educators, Inc. we know that first aid and CPR saves lives. Our American Heart Association-approved facility offers classes to meet every schedule, and our experienced educators provide an enjoyable experience that helps you feel confident as a new parent or caregiver. To learn more about our CPR classes, call us at (919) 639-4848 or fill out our contact form!